The immune system counters pathogenic microbes and toxins in the environment. The system comprises innate (non-specific) and adaptive (acquired) immunity. When innate immune cells recognize pathogens, the adaptive immune system is called into action. There are two types of adaptive immune responses: humoral immunity mediated by antibodies produced by B cells, and cell-mediated immunity mediated by T cells, a type of white blood cell. CD4+ T cells regulate/suppress immune responses through several mechanisms. Naïve CD4 T cells can differentiate into one of several lineages of effector (Teff) cells, including Th1 and Th17. In a disease-free state, Teff cells are tightly regulated by the intestinal microbiota, the community of microorganisms that normally inhabits the digestive tracts of humans and other animals. 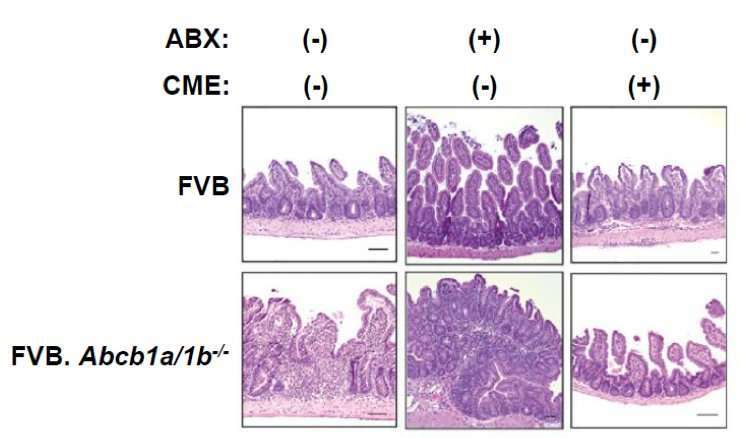 However, when there is an accumulation of Th17 and Th1 cells in the intestine, the symbiotic relationship may be disrupted, leading to conditions such as inflammatory bowel diseases (IBDs), a group of debilitating and sometimes life-threatening conditions that affect the colon and small intestine. While a great deal is known about the mechanisms underlying the symbiotic interactions between Teff cells and intestinal microbiota, far less is known about the interaction of Teff cells with metabolites, which are the intermediates and products of metabolism. This motivated an international team of researchers centered at Japan's Osaka University to fill the knowledge gap, potentially yielding valuable clues for development of robust therapeutic agents against IBDs. For their study, the researchers focused on bile acid, a detergent-like metabolite produced via cholesterol catabolism in the liver and deposited through the bile duct into the small intestine in response to food intake. Bile acids have been reported to induce oxidative stress in liver and epithelial cells by perturbing normal cell membrane architecture. "We observed in mice that Teff cells upregulate the protein Mdr1, in the end portion of the small intestine (ileum) to maintain homeostasis in the presence of bile acids," says Hisako Kayama from Osaka University and author of the study recently published in Immunity. "Notably, those lacking Mdr1 display mucosal dysfunction and induce Crohn's disease-like ileitis." Mdr1 is an important protein that is extensively distributed and expressed in the intestinal cells. It pumps xenobiotics (such as toxins or drugs) out of the cell, and has essential functions in Teff cells during bile acids exposure, limiting oxidative stress, promoting survival, and suppressing inflammatory cytokine expression. 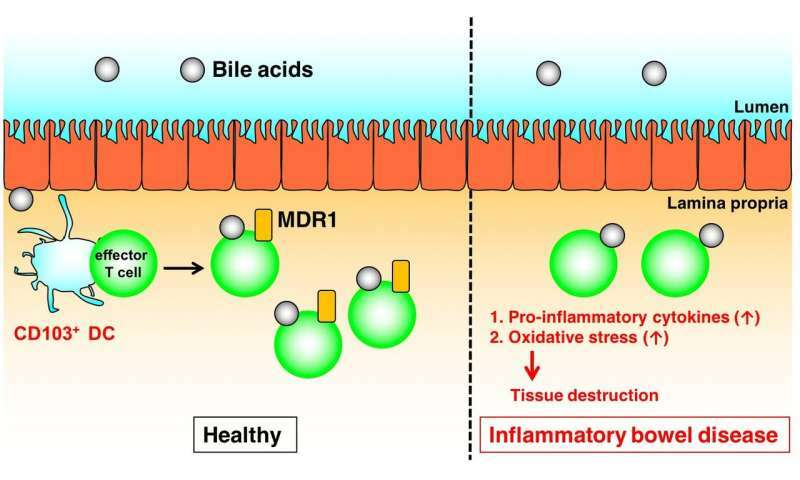 The team noted the inhibition of bile acid reabsorption in the ileum restores mucosal homeostasis in mice transplanted with Mdr1-deficient Teff cells, which underscores the involvement of Teff dysregulation in the pathogenesis of IBD. 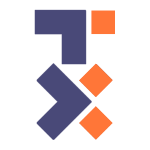 "We have also successfully identified a discernable subset of ileal Crohn's disease patients who display marked MDR1 loss-of-function in the presence of bile acids," Kayama adds. "As such, future validation studies of larger IBD patient cohorts is important to test whether an Mdr 1 loss-of-function is associated with a unique clinical course of ileal CD. Such knowledge may present opportunities for non-traditional, bile acids-directed therapy."